UP TO RM4 billion of foreign direct investment (FDI) is expected to flow into the country over the next six months as more investors see Malaysia as a good investment destination amid concern over a global economic slowdown. Its transparent laws on land matters, wide use of the English language and value-for-money destination make the country attractive, an industry observer said. Business Times understands that the inflow of FDI will come from the Middle East, South Korea, Hong Kong, China and Taiwan, and is for land acquisitions in the growth corridors, including the Klang Valley. The deals are believed to be brokered by a local property firm with international interest. "These new foreign investments could translate into a gross development value (GDV) exceeding RM15 billion," a source close to the deals told Business Times. It is learnt that a Korean developer has acquired 0.4ha in Jalan Kia Peng, Kuala Lumpur, for RM2,500 per sq ft to build a luxury one-block residence for around RM1 billion. "The land was acquired at a record price. The residences will be a stunning landmark within the Kuala Lumpur City Centre enclave and may break the record for prices of high-end products. "The developer aims to sell the units to Koreans and locals," the source said. The Iskandar Malaysia growth corridor in Johor, which has attracted RM33 billion in investments, or 70 per cent of the Johor state government's target of RM47 billion to date, is also experiencing a new wave of investments. The source said that more investments were expected to come from the United Arab Emirates, Qatar and Bahrain as investors look for prime properties like condominiums and offices in south Johor and in KLCC and Mont' Kiara, Kuala Lumpur. Companies from the Middle East - such as Kuwait Finance House, Aldar Properties, Mubadala Development Co, Millennium Development Co,Damac Properties and Limitless Dubai - are already investing in Iskandar Malaysia. Sabah, which is experiencing a mini-boom after the launch of the Sabah Development Corridor earlier this year, is attracting investors from South Korea, Hong Kong and Taiwan. Some RM500 million worth of investment is expected to be made by the first quarter of next year for resort and the broader property development," the source added. Mah Sing Group Bhd, a medium- to high-end property developer, says it is looking at more en-bloc sales opportunities for its Southbay City and Southgate commercial projects in Penang and Kuala Lumpur, respectively. LEONG: GROUP is already in talks with interested parties from the Middle East, Singapore and other neighbouring countries. "En-bloc sales provide good cashflow as well as good branding, so we do look forward to more en-bloc sales for our commercial projects," managing director Datuk Seri Leong Hoy Kum told Business Times in a recent interview. Southbay City in Penang, which has a gross development value of RM911 million, is slated for launch next year. The project is still under planning but is expected to be an integrated commercial hub comprising hotels, serviced residences, offices and restaurants. "We can sell the offices en-bloc, even the serviced residences and hotel," Leong said. Meanwhile, for the RM380 million Southgate project, the en-bloc portion comprises the corporate block with about 230,000 square feet and the Apex block with about 90,000 sq feet of net lettable space. Southgate, located in Sungai Besi, is Mah Sing's third commercial project in Kuala Lumpur. Leong said the group is already in talks with interested parties from the Middle East, Singapore and other neighbouring countries for en-bloc sales in Southgate. He hopes to be able to conclude the sale of at least one block there before year-end. "We have a good track record in our en-bloc sales as the investors are both local and foreign institutional investors. This speaks well of our design concept and our products," he remarked. Besides en-bloc sales, Mah Sing has also been making good sales for its commercial projects on a strata basis, he said. For Southgate, the group has launched three blocks on a strata basis - Vox, Vivo and Vertex - which offer office suites at an average of RM500 per sq ft and retails units at an average of RM1,000 per sq ft.
"We have closed close to RM108 million in sales since our initial launch in March till June. More than 80 per cent of Vivo and more than 50 per cent of Vertex have been taken up," he said. Demolition works at the Southgate development site are nearly finished and the group expects to start on the earthworks soon. Leong expects the development to be completed by 2011, as scheduled. Mah Sing, which has a sales target of RM560 million for this year, had already achieved sales of RM263 million in the first six months from all its property launches. For next year, Leong said, the group is targeting sales to increase by up to 20 per cent from the anticipated RM560 million this year. “And I eat out quite a lot too. I cook half of the time but other times I’m tempted to try out new restaurants,” he said, adding that his favourite was nyonya food. DAMAC Properties LLC, the largest private property developer in the Middle East, is considering building a multi-billion-ringgit integrated resort development in the East Coast Economic Region (ECER), sources said. It is understood that Damac is in discussions with the ECER implementation authority for approval of the plan. "It has expressed interest to further invest in Malaysia and has indicated its intention to move into the ECER," a source familiar with the matter said. If the deal were to materialise, it would be Damac's second investment in the country after the one in Iskandar Malaysia, Johor, where it is pumping RM397 million to develop commercial and residential properties and a private marina. The ECER, managed by state-owned Petroliam Nasional Bhd, encompasses Pahang, Kelantan and Terengganu. It is associated with oil, gas and petrochemicals; tourism; manufacturing; agriculture; and education. It is also learnt that the ECER has attracted Chinese investors who want to build resorts because of the region's proximity to South China. "There is a Chinese group which wants to cultivate about 10,000ha of padi in the ECER, and is currently in discussions with the implementation authority," the source said. The development period for the ECER will stretch till 2020. Total investment planned is estimated at RM112 billion. Under the master plan, 227 projects will be implemented. Most will come from the federal government (39 per cent), followed by private finance initiatives (27 per cent), private sector (20 per cent) and government-linked companies (14 per cent). Venus Assets Sdn Bhd, a firm controlled by Singapore property tycoon Ong Beng Seng, is set to launch the Four Seasons Hotel and Condominium project in Kuala Lumpur worth over RM2 billion by early next year. The hotel rooms and condominium units will be contained in a 60-storey building, which is being upgraded to 65 floors, pending approval from Kuala Lumpur City Hall. The building will be constructed on a 1.O4ha site between Menara Maxis and Wisma Central, which used to house an open air carpark. Venus Assets had acquired the land from Intan Sdn Bhd, a privately-held company controlled by the family of the late billionaire Tan Sri Khoo Teck Puat, for RM90 million in cash in October 2003. Based on an earlier plan, the Four Seasons Hotel with 60 floors was to be developed jointly with KLCC Holdings Bhd on a 0.64ha site adjacent to Menara Maxis owned by the latter, while the 1.O4ha site owned by Venus Assets was reserved for a 30-storey serviced apartment block. But the plan was aborted last year due to unforeseen circumstances, sources said. Venus Assets has completed piling works on the 1.O4ha site it owns to prepare for the development based on new plans submitted to City Hall. NEW LANDMARK:Syed Ysof and the Sultan of Selangor have interest in the RM2 billion project. The project, in which Tan Sri Syed Yusof Tun Syed Nasir and the Sultan of Selangor, Sultan Sharafuddin Idris Shah, have interest, is designed by Connecticut’s Pickard Chilton Architects Inc. It will feature 240 hotel rooms, 150 condominium units, six levels for parking and four retail floors, developed over four years or by mid-2013. The project is seen as the crème de la crème and will set a new benchmark price in the city. “The condominium units may be pegged from around RM3,000 per sq ft (psf) while the hotel rooms will cost more than RM750 a night, making the development the most expensive within the Kuala Lumpur City Centre (KLCC) enclave,” the source said. “Looking at projects in Kuala Lumpur where transaction prices have doubled since the launch, Venus Assets is confident of sales and is targeting buyers from around the world,” the source added. Kuala Lumpur’s current most expensive project is The Binjai by KLCC Holdings, which sits along the intersection of Persiaran KLCC and Jalan Binjai. The indicative selling price is believed to be around RM2,800 to RM3,000 per sq ft. Troika, a project by Bandar Raya Development Bhd, located at Jalan Binjai, has seen transaction price exceeding RM2,500 per sq ft, from its launch price of RM1,000 per sq ft.
Prices of Datuk Chua Ma Yu’s One KL, launched in 2005 at about RM1,000 per sq ft, have also almost doubled. From left: MAS district manager (northern region) Wan Mohd Ebrahem; Ideal Property Intelligence Sdn Bhd CEO Datuk Alex Ooi; KPMG Public Accountants Sdn Bhd partner Ooi Kok Seng; Tropical Resort Lifestyle MD Ishihara Shotaro; Joint Business Council Malaysia chairman Datuk Haji Faudzi Naim; Farlim Group Bhd executive director Ng Bock Tye; Star Business deputy news editor Angie Ng; Henry Butcher Malaysia (Penang) director Dr Teoh Poh Huat; Penang Development Corp GM Datuk Rosli Jaafar; Invest-in-Penang Bhd board of director Datuk Wong Siew Hai; Zaid Ibrahim & Co senior associate Kho Kheng Kia; Bda Architects Sdn Bhd chairman Syed Ahmad Fauzi; and Asian Public Intellectuals senior fellow Dr. Lim Mah Hui. Starbiz: What are the strategies that can be employed to make Penang a destination of choice for second home and property investment? Ishihara Shotaro: The developers in Penang should really look into building apartments with built-up areas ranging between 900 and 1,300 sq ft that come with two bedrooms, priced between RM400,000 and RM600,000. The Japanese buying properties in Penang are usually retired old couples and they are not looking looking for units that are very large size, for example, like a super-condominium. Developers should also look into providing professional management services for foreign buyers. Penang is losing out as a second home destination to Australia and Hawaii, where professional management services for high-rise properties are available. Some 85% of the Japanese staying in Penang rent their homes. There are about 300 Japanese couples staying in Penang. Penang also has to stop advertising and promoting itself as an island resort with nice beaches. The beaches and waters here are dirty and this has adversely affected tourist arrivals from Japan and South Korea. Singapore and Hong Kong don’t promote themselves as island with nice beaches so tourists also do not have such expectation when they visit Singapore or Hong Kong. Datuk Alex Ooi: There’s a need to upgrade the state’s transportation system, hygiene, environment and traffic management in order to attract Malaysia My Second Home (MM2H) programme participants. I recently bumped into several Japanese and their main complaint is the transportation system in Penang. Previously, there were Penang maps everywhere. However, I can hardly find any now, even at the airport. When I travel abroad, I usually bring a bunch of them to distribute overseas. To attract foreign investors, we also need more international schools. Some foreigners are complaining that there are not enough of such schools. Datuk Wong Siew Hai: There must be improvements made in the security of Penang, where burglaries are prevalent. This is the reason why gated projects are popular, as house owners want to avoid thefts. Properties here are still cheap in comparison with the properties in Kuala Lumpur and Singapore. Our property prices are about 15% of the same range of properties in Singapore. The prices in Penang are between 40% and 50% of the Kuala Lumpur selling price. Datuk Rosli Jaafar: For Penang Development Corp, we don’t have much experience with the MM2H programme. One thing I’d like to understand from the Japanese is whether they want to stay within their own community or they don’t mind being apart of the local community. This factor will have a bearing on our architectural designs. There should also be more varied pricing and not just either focus on the high end, the middle cost and the low end pricing. In addition, there are a lot of restrictions on our designs caused by the bylaws. If you look at the bylaws, there are certain requirements involving the height, ventilation and staircase of the projects which we have to abide. Datuk Faudzi Naim: Our second home programme is currently attracting investors from north Sumatra. These investors are impressed with Penang’s positioning as a hub for education and medical services. Last year I promoted Penang properties in Medan. It generated much interest among the potential investors who the came to Penang later to buy some RM30mil and RM40mil worth of properties. These investors always compare Penang and Singapore as a choice destination for second homes. Thus I believe that the property prices in Penang will hit between RM750 and RM1,000 per sq ft by 2010. We must, of course, work towards providing the foreign investors with what they are looking for such as high quality professional management services for the high-rise properties, raising the security standards, and improving the garbage collection system and traffic conditions in the state. Wan Mohd Ebrahem: Malaysia Airlines is the first airline to have signed an agreement with Henry Butcher to conduct special tours for foreigners to view Penang’s properties. Critics have said, “How can an airline and real estate surveyor get married?” This is to create awareness on what kind of properties are available in Penang. This could be my last forum because I’m leaving Penang. My boss is sending me to India. StarBiz: What are the factors that could be considered to increase domestic demand for properties? Faudzi: To increase domestic demand for properties, the state government must play a role to bring down the costs of properties. The selling prices of properties are being driven up because developers have to cross-subsidise low-cost housing from other projects. Thus the state government must stop requiring the developers to fulfil low-cost housing obligation. There must be a different policy to provide low-cost housing to the lower income group. The state government should look into redeveloping certain districts in the mainland as growth centres and as an area for affordable housing. Wong: Penang must be able to attract the young people to come over. It is not able to attract the younger generation because Penang is not known to be a happening place. I have friends who can go to a different restaurant in Kuala Lumpur every day for 365 days. But in Penang, there isn’t much to do. If Penang can transform itself into a happening place, then it can attract the younger generation to stay and work in Penang. These people can then drive the demand for property here. Dr Lim Mah Hui: If you look at Japan at the height of its stock and property market in 1989, the value of land around the Imperial Palace was worth more than all the land in California. Its urban land price index increased to more than 100. It has dropped over the years to 60 now. I encouraged developers and real estate surveyors to collect statistics and make them public. When developers sell their units, they must have the buyers’ profile, which includes details like their nationality and income, to create a data bank. This is important for developers to know how much more to build. One more thing I want to say. I disagree that Penang is underdeveloped. If you live in a town like Kyoto, you will see it’s a wonderful town. It has stringent laws on their development. Its authorities used to allow buildings to be as high as 10 storeys, but now this has been reduced to eight storeys. There are too many condominiums in Penang and they have horrible quality. I don’t understand how the MPPP (Penang Municipal Council) and developers can allow this to happen. It’s better to go for quality than for quantity. I think they should be torn down and rebuilt. StarBiz: Is there a perceived oversupply of residential properties? Ooi: For the past three to five years, many people invested in properties due to the low interest rates and a sluggish capital market. Housing loans are very attractive as they are 0% to 2% below the base lending rate (BLR) which is about 6%. As there is likelihood that Bank Negara may increase the BLR to curb inflation, the property market may be negatively impacted, as there would be forced selling of properties. Rosli: Once you have reached an optimised level, any further development may cause chaos. We can’t simply continue to develop and develop. Certain areas that have reached an optimised development level should be redeveloped instead. Gated communities are not actually catered for in the existing bylaws. I was told there’s still much confusion on them. Looking at low cost and low medium-cost projects, it’s sad to say that many foreign workers are occupying them. When they leave one day, who’s going to occupy them? There are also many houses in the mainland, which are sold but not occupied. The owners could have been speculating when they bought them. We often hear of low cost houses being auctioned off below the market price. Developers are building these houses not because they want to but because they have to. Even in my area, 8% of the units are sold but are unoccupied. Ng Bock Tye: Penang is underdeveloped. However, we must be careful in the type of development we plan to do. Penang should go for high-density development, especially along Penang Outer Ring Road. StarBiz: What can be done to improve the livability? Syed Ahmad Fauzi: Penang still got historical charm and is till today a melting pot of diverse cultures. Firstly, the red tape should be reduced in the state and local government machinery. The concentration of executive power on the above hinders the implementation of projects that can raise the quality of life and the livability of Penang. We also need to set up a fund to restore Gurney Drive, which is a nostalgic place, and the beaches. We also need more car parking space and good marketing efforts to promote Penang. Wong: The manufacturing sector contributes about 40% of the state gross domesticproduct. It is important to keep this sector healthy so that it can in return provide support for the property sector. Penang now lacks the ingredients of a happening place, which is essential to attract a younger generation of house buyers to move over. Ooi: Penang has got the natural environment and historical culture. To make it livable, you would need to have a bigger population with the spending power, as money is crucial to drive growth. Thus we need a bigger population and to do that Penang has to become a happening place. Local entrepreneurs must also explore blue ocean strategies and fresh areas of business opportunities to create spill over economic effects. StarBiz: On financing and house purchases, what strategies can be employed to ensure adequate financing for the housing market? Lim: I’m not a developer but I can speak from the economic and social point of view. Speaking as an ex-banker and looking at the bigger picture, I don’t think it’s actually wise to encourage a higher loan margin. For 20 years, I’ve been a banker in the overseas - New York, Tokyo, Singapore, Hong Kong. I want to share what are the factors which usually precede a banking and financial crisis. There’s too much money flowing into the system either from foreign investors or due to the central bank’s policy being too loose. This invariably leads to two types of bubble. The first is the property bubble while the other concerns the stock. It has happened in the past and it’s happening today. The cost of cleaning up a banking crisis is enormous. Developers should not just build and build to make more money. Thus it’s okay to take into account that we should not overdevelop. The current loan margin of 70% is fine. If one does not have money, the one shouldn’t be buying. I lived in Manila for six years and I also lived in Jakarta. I think gated communities are not desirable because they’re too exclusive. I can’t pass from one town to another because they are all gated. I have to go round and round and use a longer route. We should not cater to every whim and fancy of the foreigners. I had been away for over 25 years and when I came back to Penang a year ago, I found that it’s overdeveloped. I can’t understand how people can afford to buy properties worth millions of ringgit. I was recently informed that only 5% of the total households in Malaysia earned RM10,000 or more monthly. I also didn’t know that foreigners could buy houses here. They can’t do that in Thailand, Indonesia and Singapore. By allowing them to do it here, it will push up the property prices. Where are the local people going to go? This is a very crucial issue for developers to consider. StarBiz: Will mega transportation projects solve Penang’s traffic woes? Ng: When the second Penang bridge is completed, we will need an outer ring road to complement it. So the government must build one or else there’s no way of dispersing traffic. Lastly, I would like to say that a high-density project does not mean that it generate a poor environment. It can be a good one if there’s proper planning. Lim: I don’t think another outer ring road is the answer. We should go the same route as Singapore where one has to pay through his nose to have a car. Higher parking rates and taxes on cars should be imposed. Rosli: There are two issues which need to be addressed: transportation and security. I share the view that there’s inadequacy in the transportation system. Monorails and building more roads may not be the best way. There are already a lot of roads here. The problem is the buses here don’t stop at the right time and right place. More roads and bridges will result in more cars. We should reverse the scenario by making it inconvenient to use cars. In some parts of the world, the number of roads was reduced. In one place 20 years ago, there was a busy road. Today, it’s parkland. The road is gone. On the security aspect, if you are rich, of course you can pay anything to be well guarded. But for the poor, they can rely on a good design, which promotes security surveillance. PENANG: The property market in the country may not be sustainable for long due to the possibility of an increase in the base lending interest rates. KPMG partner Ooi Kok Seng said the low interest rates had been maintained for the past five years for housing loans, which were very attractive as they were 0% to 2% below the base lending rate, which was about 6%. “Since the capital market has been sluggish and bank interest low, many people have invested in properties instead. “Thus, any adjustment in the interest rates by Bank Negara to curb inflation may negatively impact the property market as there would be forced selling of properties,” he told StarBiz. 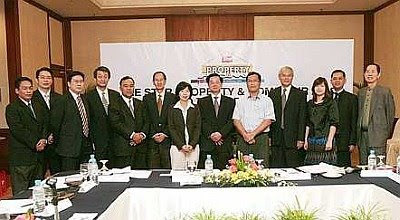 Ooi was giving his views at The Star Property and Home Fair Penang 2008 roundtable discussion in Penang recently. The three-day exhibition from Sept 5 will be held at the Penang International Sports Arena. Another participant at the roundtable discussion, Dr Lim Mah Hui, said the factors preceding a banking and financial crisis usually involved too much money flowing into the system either from foreign investors or due to the central bank’s policy of being too loose. “This invariably leads to two types of bubble. The first is the property bubble while the other concerns the stock. It has happened in the past and it’s happening today. The cost of cleaning up a banking crisis is enormous. Developers should not just build and build to make more money. “Thus, it’s okay to take into account that we should not overdevelop. The current loan margin of 70% is fine. If one does not have money, then one shouldn’t be buying property,” he said. Lim is a senior fellow attached to the Asian Public Intellectuals fellowship. Meanwhile, Joint Business Council Malaysia chairman Datuk Faudzi Naim was more optimistic. “I believe property prices in Penang will hit RM750 to RM1,000 per sq ft by 2010. This is because there are foreign investors who are interested in Penang due to its positioning as a hub for education and medical services. “Last year I helped out in promoting Penang properties in Medan. Within a year, investors from northern Sumatra came over and bought properties worth RM30mil to RM40mil. “These investors always compare Penang with Singapore as a choice destination for second homes,” he said. However, Faudzi said developers must now also provide high quality professional management services for high-rise properties. “Foreign house buyers want professional management services to look after their investments when they are away. The Government must also, of course, beef up the local security situation, and improve on the hygiene and traffic conditions,” he said. Faudzi also said the state government should stop making developers build affordable housing. He sad the state government should look into redeveloping certain districts on the mainland as growth centres and as an area for affordable housing. Another participant Tropical Resort Lifestyle Sdn Bhd managing director Ishihara Shotaro said Penang had to stop advertising and promoting itself as an island resort with nice beaches. “The waters are dirty. This has started to have an impact on tourist arrivals from Japan and Korea. “Singapore and Hong Kong don’t promote themselves as island with nice beaches, so tourists also do not have such expectation when they visit Singapore or Hong Kong,” he said.